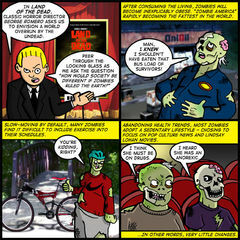 In Zombie America, Linday Lohan will still be working and she will look FABULOUS! I’m really sorry that I didn’t come back with a blog sooner. I need to stop making promises like this to you guys. To be fair, work has been hectic this week. I’m preparing a newly designed web site for my company and have been concentrating on it on it so diligently for the last two weeks, it feels like there has been little time for anything else. My personal life has been cluttered as well. Relatives visiting from out of state. Cami away at her night classes. Packing up things in the house for our move on July 12. My attention hasn’t been this fractured since 1996 when – over the summer – I graduated from high school, prepared for college and watched three elderly relatives pass away. It is 11:08 on a Saturday night and this has been my first time at the computer since I left work at 5:00 on Friday. I’m making excuses. I know it. I’m divulging all this personal crap when you’ve come here to be entertained. I know it. Maybe I’m showing too much of my hand here. Maybe I should stick to the script, be mysterious, not let you in too much on my personal life. But I can’t do it. Because sitting here and typing everything out makes it more real, helps me deal with it and helps me move forward. And this is just as much for me as for you. Besides, not everyone can be a tough-talkin’ hombre. Maybe in some sweet way, my insecurity endears me to you? A boy can dream, can’t he? How very emo of me. Hey, I just saw Bewitched tonight and I would love to sit here and talk about it. But truthfully, I’m just so tired these days. Just… bear with me for a little while. Things will get back to normal eventually. In the meantime, I appreciate your support and patience. And for everyone who sent me an e-mail, purchased a shirt or advertising to whom I haven’t responded yet, I will get to you soon.